he doesn't realize that the track he has covered is curved. I was lucky enough to have spotted it." -- goodwill among men and peace on earth. "If I had my life to live over again, I'd be a plumber." I live my daydreams in music. I see my life in terms of music. ... I get most joy in life out of music." If only I had known, I should have become a watchmaker." I have never looked upon ease and happiness as ends in themselves - such an ethical basis I call more proper for a herd of swine. "I want to know God's thoughts,..... the rest are details.."
"My life is a simple thing that would interest no one. It is a known fact that I was born and that is all that is necessary." in order to find in this way peace and security which he can not find in the narrow whirlpool of personal experience." community to which your later work belongs." "Teaching should be such that what is offered is perceived as a valuable gift and not as a hard duty ." and the childlike desire for recognition and to guide the child over to important fields for society. Such a school demands from the teacher that he be a kind of artist in his province." "To me the worst thing seems to be a school principally to work with methods of fear, force and artificial authority. and produces a subservient subject." "One should guard against preaching to young people success in the customary form as the main aim in life. The most important motive for work in school and in life is pleasure in work, pleasure in its result, and the knowledge of the value of the result to the community." Whoever undertakes to set himself up as judge in the field of truth and knowledge is shipwrecked by the laughter of the Gods." "One had to cram all this stuff into one's mind for the examinations, whether one liked it or not. I found the consideration of any scientific problems distasteful to me for an entire year." submit to hereditary prejudices but honestly and courageously uses his intelligence." "Only a life lived for others is a life worth while ." "A hundred times every day I remind myself that my inner and outer life are based on the labors of others. "Gravitation can not be held responsible for people falling in love"
call it Intuition or what you will, the solution comes to you and you don't know how or why". "Common sense is the collection of prejudices acquired by age 18. "If A equals success, then the formula is: A=X+Y+Z. X is work. Y is play. Z is keep your mouth shut." "Only one who devotes himself to a cause with his whole strength and soul can be a true master. "(1) Those instrumental goods which should serve to maintain the life and health of all human beings should be produced by the least possible labour of all. (2) The satisfaction of physical needs is indeed the indespensible precondition of a satisfactory existence, but in itself is not enough. In order to be content men must also have the possibility of developing their intellectual and artistic powers to whatever extent accord with their personal characteristics and abilities." reiterated thoughtlessly by the Americans themselves." How on earth are you ever going to explain in terms of chemistry and physics so important a biological phenomenon as first love?" an hour, and it seems like a minute. THAT'S relativity." "Intelligence makes clear to us the interrelationship of means and ends. But mere thinking cannot give us a sense of the ultimate and fundamental ends. To make clear these fundamental ends and valuations and to set them fast in the emotional life of the individual, seems to me precisely the most important function which religion has to form in the social life of man." Awaken the cosmic religious feeling and keep it alive." souls harbor such thoughts through fear or ridiculous egotisms." himself in the slight details we are able to perceive with our frail and feeble mind." rather than to rule, or to impose himself in any otherway." restrained by fear of punishment and hope of reward after death." blind faith, but through striving after rational knowledge." that is, as something living, without its being necessary to find justification for their existence. their nature simply and clearly." present and past times, left inside"
leading the individual towards freedom." unbounded admiration for the structure of the world so far as our science can reveal it." suffer in soul or we get fat." genuinely religious feeling that has nothing to do with mysticism"
precisely the most important function which religion has to form in the social life of man." as "God does not play dice with the universe." in the little that we, with our we ak and transitory understanding, can comprehend of reality. "If the possibility of the spiritual development of all individuals is to be secured, a second kind of outward freedom is necessary. The development of science and of the creative activities of the spirit in general requires still another kind of freedom, which may be characterised as inward freedom. It is this freedom of the spirit which consists in the interdependence of thought from the restrictions of authoritarian and social prejudices as well as from unphilosophical routinizing and habit in general. This inward freedom is an infrequent gift of nature and a worthy object for the individual." of genius -- and a lot of courage -- to move in the opposite direction." "But could not our situation be compared to one of a menacing epidemic? People are unable to view this situation in its true light, for their eyes are blinded by passion. General fear and anxiety create hatred and aggressiveness. The adaptation to warlike aims and activities has corrupted the mentality of man; as a result, intelligent, objective and humane thinking has hardly any effect and is even suspected and persecuted as unpatriotic." 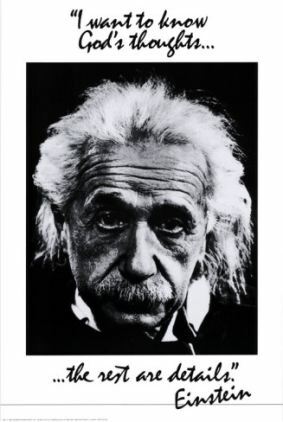 ~Einstein "The Menace of Mass Destruction"
brutality, deplorable love-of-country stance, how violently I hate all this, how despicable and ignoble war is; I would rather be torn to shreds than be a part of so base an action! It is my conviction that killing under the cloak of war is nothing but an act of murder." I have walked in his moccasins for two weeks. only by the creation of a world government." or to lend support of any kind, whether direct or indirect." save our modes of thinking, and thus we drift toward unparalleled catastrophe." "Since I do not foresee that atomic energy is to be a great boon for a long time, I have to say that for the present it is a menace. Perhaps it is well that it should be. It many intimidate the human race into bringing order into it's international affairs, which without the pressure of fear, it would not do." "In our time the military mentality is still more dangerous than formerly because the offensive weapons have become much more powerful than the defensive ones. Therefore, it leads, by necessity, to preventive war. The general insecurity that goes hand in hand with this results in the sacrifice of the citizen's civil rights to the supposed welfare of the state. Political witch-hunting, controls of all sorts (e.g., control of teaching and research, of the press, and so forth) appear inevitable, and for this reason do not encounter that popular resistance, which, were it not for the military mentality, would provide protection. A reappraisal of all values gradually takes place insofar as everything that does not clearly serve the utopian ends is regarded and treated as inferior." 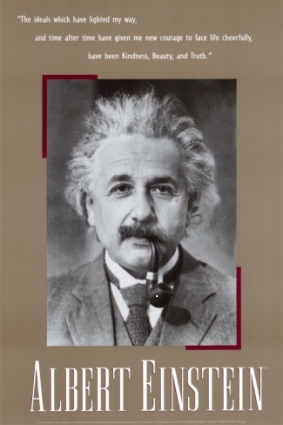 ~ Einstein "The Military Mentality"
tyrants of genius are succeeded by scoundrels." As long as armies exist, any serious conflict will lead to war. It is characteristic of the military mentality that non-human factors are held essential, while the human being, his desires and thoughts, are considered as unimportant and secondary. To concentrate on the problems and aspirations which all thinking men share creates a sense of comradeship that is eventually bound to reunite scholars and artists of all nations. A large part of history is replete with the struggle for human rights, an eternal struggle in which final vistory can never be won. But to tire in that struggle would mean the ruin of society. We scientists, whose tragic destination has been to help in making the methods of annihilation more gruesome and more effective, must consider it our solemn and transcendent duty to do all in our power in preventing these weapons from being used for the brutal purpose for which they were invented. What task could possibly be more important to us? What social aim could be closer to our hearts? name of patriotism -- how passionately I hate them!" war cannot be humanized. It can only be eliminated..."